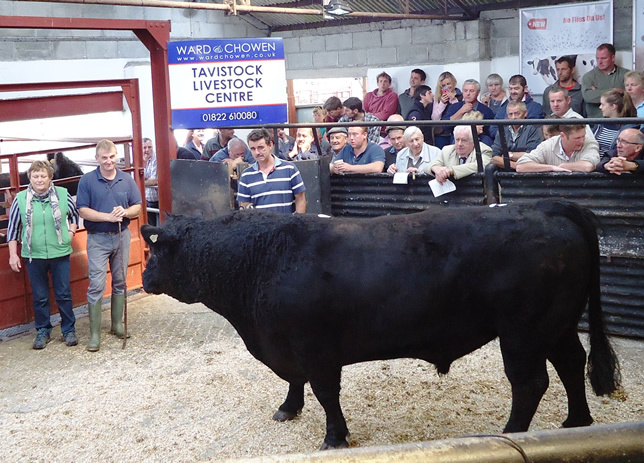 Tavistock Livestock Centre held the seventh annual show and sale under the auspice of the Galloway Cattle Society. Once again a show was held with classes for best bull, best heifer and *new for 2016* best cross bred heifer which was kindly judged by Mrs M Alford, Whitchurch and Mr S Smith, Altarnun. Top price Galloway Bull realised an amazing 2300 guineas for a 5yr Galloway from Mrs E M Alford & Son, Whitchurch. This bull was not entered in the show as it was sold by the judge. In the show best bull along with shield kindly donated by Mole Valley Farmers went to C Hamer, Powys for 4yo Hirmant Bryn Mawr which sold to 1250 guineas and gaining Champion. Second prize went to AW Francis, Okehampton for 47mo Rowbrook Imran BR00468 selling for 750 guineas and gaining Reserve Champion. Third prize went to S Langdon, Molland for 4yo Fowley Warrior BR00376. In the best pedigree heifer class first prize went to KC & JC Heard, Okehampton for 19mo Fowley Quartz Ninette A513 F52573 which realised 410 guineas and won the shield kindly donated by Ken Heard. Second prize also went to WT Winters, Sussex for 31mo Goldie 3rd of the Valley F53539 realising 480 guineas and gaining top price pedigree heifer of the day and third prize went to the same vendor for 25mo Hinke 3rd of the Valley F53556 selling for 420 guineas. Best crossbred heifer went to J. Savery & Son, Diptford for a 24mo Aberdeen Angus x realising £750, winning the bottle of Whisky kindly donated by Tavistock Livestock Centre and £50 voucher from DI Bridgman and Son. Second prize went to CD & S Alford, Okehampton for a 37mo realising £520. Third prize went to J Savery & Son, Diptford for a 25mo Aberdeen Angus x realising £760. Cows and calves sold to £660 for 6yo Lettie 34th of Gass F48041with her 2mo purebred heifer calf at foot from Mr C Groves, Bridgewater.